A couple of weeks ago, I ran across a really interesting story from Operation Desert Storm. 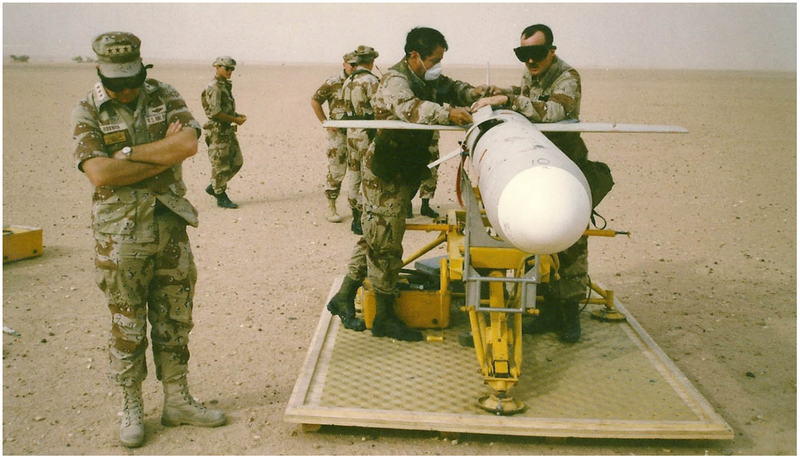 Did you know the United States deployed a Ground-Launched Cruise Missile (GLCM) unit in Saudi Arabia? 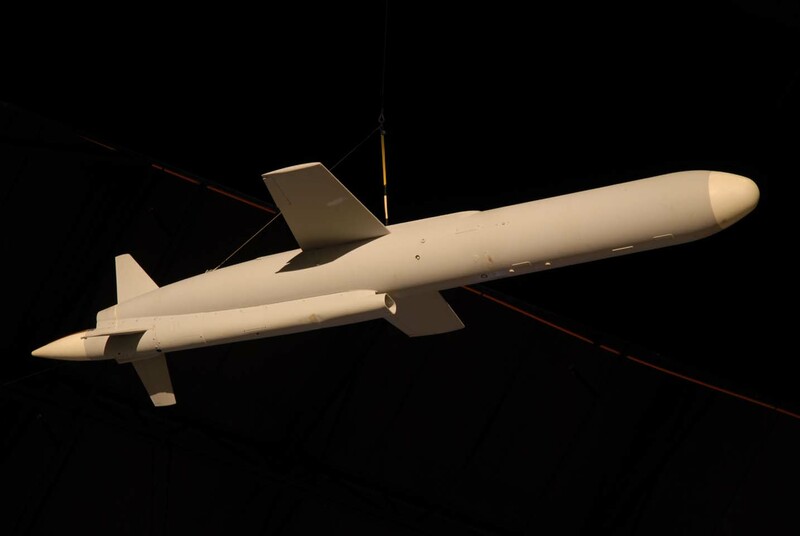 But, instead of being equipped with nuclear-armed BGM-109G Gryphon, the unit deployed with Navy BQM-74 Chukar drones that were used to spoof the radars associated with Iraq’s air defenses. The operation, known as Scathe Mean, is really interesting tale. Scathe Mean was awesome and saved a lot of lives. It also raises some fascinating questions about intelligence, signaling and the potential for misinterpretation. Philip Smith, “Tactical Deception in the Desert – Scathe Mean,” in From the Line in the Sand: Accounts of USAF Company Grade Officers in Support of Desert Shield/Desert Storm, Michael P. Vriesanga (Department of the Air Force, 1994) pp 93-102. Doug Livingston, “Desert Storm – A Short Rebirth of the GLCM Force,” Association of Air Force Missileers Newsletter 7:2 (June 1999) pp 1, 5-8. The short version is that the Air Force wanted to send a wave of target drones into Iraq to fool the Iraqis into turning on their radars, with a large number of strike aircraft following to, uh, turn them back off permanently. One major question was who would launch the drones, which are basically cruise missiles — take a look at the BQM-74 in the picture. (In fact, the M in BQM stands for missile.) As it turns out, the Air Force was in the process of decommissioning GLCM units to meet its obligations under the 1987 Intermediate-Range Nuclear Forces Treaty. Those units represented the right pool of skills for the mission. A second problem is was the launch mode. While the drones could be launched from multiple environments — that’s the B in BQM — multiple in this context means ships and aircraft. (It’s like both kinds of music: Country and Western.) Ground-launch, as the Air Fore proposed doing, was novel. The drones use Jet Fuel Assisted Take-Off (JATO). The unit had to acquire trucks to support JATO fuel tanks and other equipment to support ground-launch. The unit did all this under incredible secrecy. Three C5 and two C-141 aircraft flew 26 trucks and 40 drones, support equipment and operational crews to King Khalid Military City. The ruse worked perfectly. 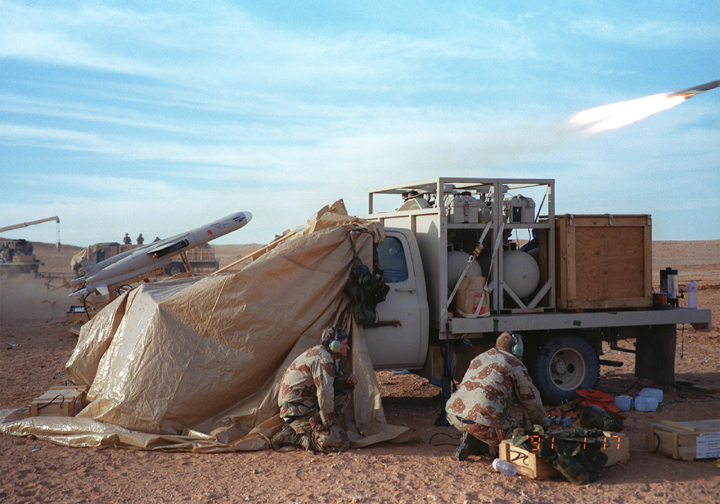 The damage to the Iraqi air defense network in the first few days was sufficient that, according to Aviation Week & Space Technology, “the Iraqis resorted to simply shooting their missiles without turning on radar when allied aircraft were in the area.” One of the remaining drones from Scathe Mean is now on display at the National Museum of the United States Air Force. All by itself, this is a cool story. But it really struck me — what if the Soviets had learned of the deployment? What if they knew that the United States, under the greatest of secrecy, was deploying a ground-launched cruise missile unit to Saudi Arabia? That would have been interesting. From a certain angle the drone looks an awful lot like a BGM-109G Gryphon. Yes, there are visible differences, but those differences might not be visible at a glimpse or in a blurry image. And what about the trucks? You can imagine the Soviets pointing out there trucks are not a routine part of the BQM launch process. If Moscow had stumbled on Scathe Mean, they would have concluded it was a covert deployment of nuclear-armed GLCMs to the Saudi desert under the flimsiest of pretenses. In that event, I bet no amount of reassurance would have persuaded Moscow otherwise. RT already spouts conspiracy theories about the US secretly nuking Iraq in 1991. I can only imagine what they would have done with this. My favorite anecdote is from the so-called Saddam Tapes. 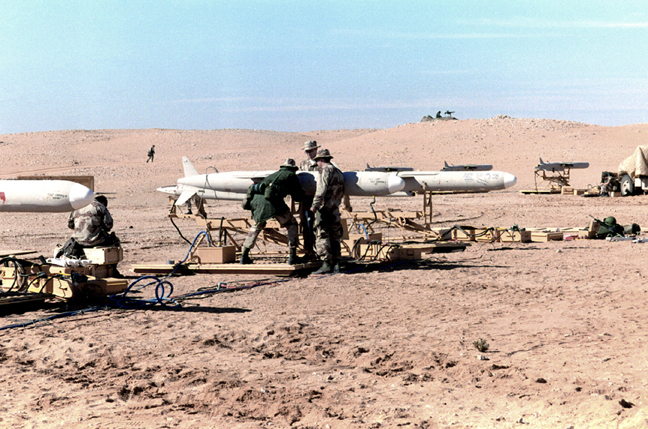 Saddam was convinced that Israel had U.S.-supplied Pershing missiles — and would use them to retaliate against Scud attacks. What I love about this transcript is that his advisors try to correct him — but they don’t try too hard. I am reminded of that documentary where Vivek Ranadive, the gloriously incompetent owner of the NBA’s Sacramento Kings, strong-arms his management into drafting Nik Stuaskas over Elfrid Payton by making his preference clear, then going around the table asking each employee: “Stauskas?! Stauskas?! The transcript is below. Imagine if Saddam had been told about Scathe Mean! Confirmation bias is a powerful thing. And often, true explanations simply aren’t all that persuasive since many decisions are made on context-specific or even flimsy grounds. Had Scathe Mean leaked, I suspect the mundane but critical reality of spoofing Iraqi air defenses would have been drowned in beltway op-eds interpreting the “message” being sent to Moscow or Baghdad. Had secrecy cracked, pundits and decision-makers would probably have denied the possibility of an accidental leak, looking for some “deeper” meaning. Fortunately that didn’t happen here — both for the success of the mission and for the fact that we have a case study where a potentially suspicious event has a perfectly reasonable explanation. Sometimes a drone is a just a drone. Excerpt from the Saddam Tapes. Note: I have edited the notes in the brackets for clarity. Saddam: This will be normal. [Israel] will also reciprocate by attacking us with missiles. They have missiles. Izzat al-Duri: They have cruise missiles. Unidentified Male: No, they have a different kind. Saddam: They have Pershing missiles. Saddam: Pershing, they have Pershing. Unidentified Male: They get them from America. Saddam: Let them have Pershing. ‘Adil: They have had Pershing for a long time. Izzat al-Duri: Pershing is American. ‘Adil: I do not think the Pershing has the range to reach Baghdad [inaudible]. Saddam: Pershing has the range to reach al-Habbaniyah. ‘Adil: Yes, to Fallujah and Habaniyah. Saddam: But perhaps the Ariha can reach. They [the Americans] must have given them [the Israelis] some missiles lately. Yeah. Izzat al-Duri: Who [inaudible] from Saudi Arabia? Saddam: Abu-Ahmad [‘Adil], this is not worth talking about! Its only recently that I found this website, and will be spending far too many hours reading these gems of history and events. Thank you. I think you answered your own question, indirectly, by noting that the US used the training unit to field these drones. If they had moved one of the active units, that would have raised more than a few eyebrows, and not just in Russia…it would have given everyone a nervous feeling, especially since the US does not answer questions regarding exactly what is mounted on those missiles: it made eminent sense, then, to use the training unit to do this. Using the training unit because they had the most experience on the system and remained the most current on the system at the time. They also may have had the most familiarity with configuring and trouble shooting the system.